It seems that the cynical, almost nihilistic attitude which permeates this has now become the default setting for a large swathe of society. Indeed, Chris wondered whether this was some kind of recruitment film for the alt-right, a reasonable question given the black shirts, buzz cuts and rabid sloganeering. The film is curiously ambivalent about all that. There’s no doubt that Durden and the nameless narrator (Norton) say many things which make a great deal of sense, about people’s willingness to mistake material possessions for fulfillment and vulnerability to advertising. It’s summed up in catchy – almost jingle-like – phrases such as “The things you own end up owning you,” which are hard to argue with. But on the other hand, the narrator is clearly barking mad. The Durden character is nothing but a projection of the protagonist’s own psyche, being all the “cool” things which the narrator wants to be. There’s an interesting theory that the main female character, Marla (Bonham-Carter) may be entirely illusory too, representing another aspect of the narrator’s personality. Indeed, you could make a case that just about anything in the film is the product of a deranged imagination – even the bits that appear to make logical sense. It’s a strange place to put the viewer. Is the film condoning its fascism as a sensible reaction to modern times, or condemning it? Why can’t you pick a reality/viewpoint and stick with it, Mr. Fincher? That’s where the movie’s nihilism really kicks in. If it depicts the shallow consumerist hell in which the majority of people reside (not necessarily unhappily, it must be said), the alternative is not exactly painted in glowing terms either. Self-loathing, leading to a descent into madness and suicide? Where do we sign up? 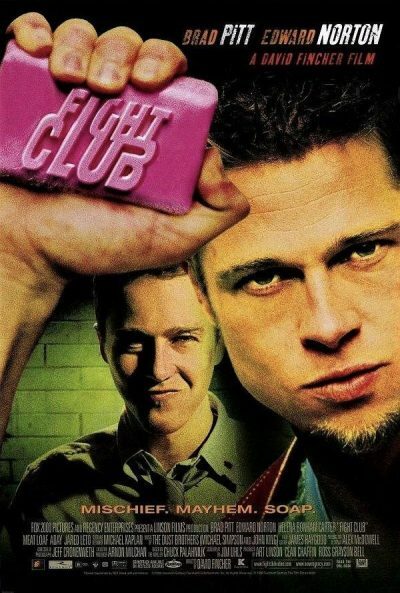 Fight Club is a film apparently only interested in pointing out flaws, in both society and the characters it portrays. There’s hardly anyone here who could even remotely be described as “likeable”, by the time the final credits roll, over the appropriate Pixies’ song, Where is My Mind? Still, the performances pull the audience along on the trip, and this perhaps marks the start of Pitt’s best period as an actor. I note, perhaps pointedly, the presence of a movie marquee here for Seven Years in Tibet… And maybe Tyler Durden went on to use the boxing skills acquired here in his identity as a pikey bare-knuckle boxer? Have that as a fan theory. 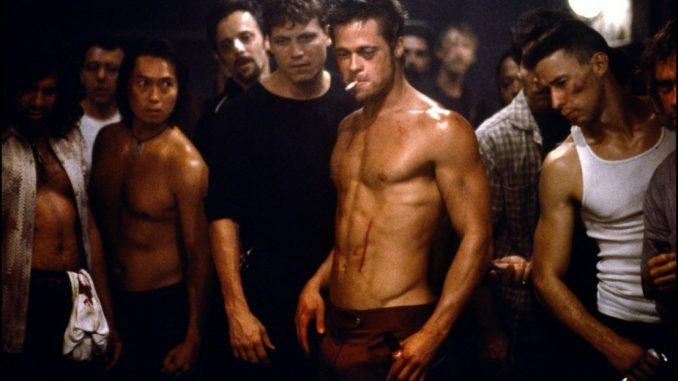 While Fight Club likely hasn’t stood the test of time quite as well as its reputation might have suggested, this is still capable of pushing some necessary buttons. It’s no less incendiary now, than at the time of its release, a couple of months after the Columbine massacre took young rage to the next level.